For the last 200 years, baseball has been one of the most widely played games in the United States. From school games, all the way up to the World Series players have thrilled crowds with this exciting bat and ball game. The game has spawned incredible players as well as moments and memories that will last indefinitely. But once you’ve bought your season ticket and clothes with you team colors what else does the ultimate fan need? A baseball tattoo, of course! This game, which is played between two teams, originated from bat and ball games played in the 18th century in England. When immigrants came over to the US they brought the games with them and by the late 19th century the game had evolved and was soon recorded as the countries national sport. While baseball is not incredibly popular in other countries it is widely played in South America, Asia, and the Caribbean. While there are plenty of female baseball fans most clients who request this type of tattoo are men. If women do get a design like this they usually opt for something smaller than their male counterparts. What is The Meaning Of a Baseball Inspired Tattoo? Fans love baseball for so many different reasons. Some have played the sport as children and developed a lifelong passion. The feeling of being part of a team and of course winning are a great way to feel good about yourself and keep fit. Others love watching the game in an arena surrounded by other fans, able to soak up the atmosphere and share in the excitement. Sometimes the love of baseball is one that is passed down through the generations. Whatever the reason may be getting a baseball tattoo means one thing – you love the game! Baseball Rosary or Cross – Sport, and religion are two areas where passion runs deep. That’s probably why designs that mix Christian symbols such as the rosary or cross with baseball themes are so popular. In these designs, the rosary will sometimes be draped over a baseball or a cross will have the highly recognizable baseball stitching as an added detail. Ball and Skull Combination – Men like darker, more aggressive tattoos and the skull / baseball design is a great example of this. These designs will sometimes feature a skull with stitching and two baseball bats cross behind – a take on the skull and crossbones emblem. Team Logos / Emblems – Are you a fan for life? If you think so, then you could consider getting the logo or emblem of your favorite team as a tattoo. Think about it carefully first! Portraits of Players – Babe Ruth, Jackie Robinson, Lou Gehrig – there are so many incredible sportsmen that have graced this game. 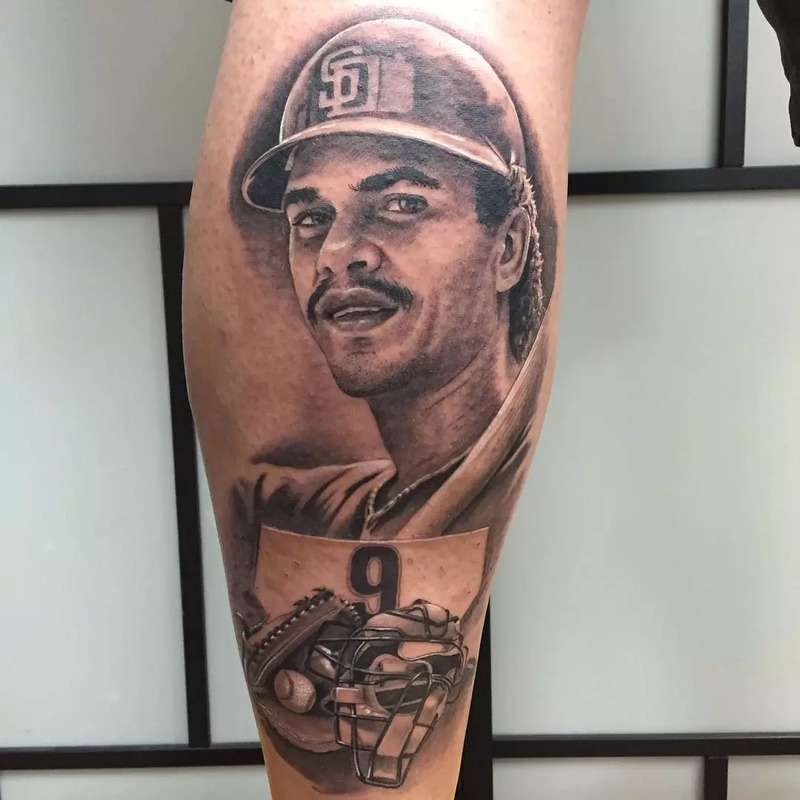 While some fans want to remember certain moments others may choose to rather have portrait style tattoos of their favorite baseball players. Sometimes these will be portraits but other times they may include details like an arena in the background. These can be done in a sketch technique way or in full color. Baseballs / Bats / Gloves /Caps– Identifying yourself as a baseball fan is pretty easy – the equipment and paraphernalia are quite unique! For smaller designs, clients may request designs of baseballs and bats (often two bats crossed over each other with a ball in the center) as well as gloves and balls. Stitching – The stitching on a baseball is very distinguishing and is seen almost as a symbol of the game itself. 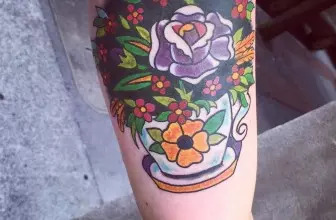 This stitching is commonly requested in tattoo designs, usually in black or red, and can look quite incredible as a hyper-realistic or even 3D tattoo. These designs can work well in both black and color. For portraits, skulls, and smaller designs the clients will often opt for black and gray with shading. Sometimes men like to dedicate their entire back for a baseball-inspired tattoo adding all types of designs together or using a design such as a portrait and this can look good in color but is usually done in black and gray. The same is true for baseball arm and leg sleeves. The stitching designs look best in red, brown, or black (as found on the baseballs) and logos or emblems will usually be done in the team colors. This kind of design is extremely versatile and your placement basically depends on the size you want the tattoo and your preferences. Obviously, larger tattoos like scenes and portraits will look better on larger areas such as the back, thigh or upper arm. Some men also use their calves for tattoos like this. Other designs can be placed on the shoulders, ribs, forearm, chest or abdomen. It basically depends on how much you want others to be able to see your tattoo as well! If you want a tattoo that stands out from the rest, then consider a hyper-realistic or 3D design. Baseballs, players, and stitching are all excellent subjects for a tattoo that appears to leap off the skin. Your fellow fans will be green with envy! Another way to make your tattoo stand out is to include a famous saying or quote in your design. These could be quotes from your favorite player or sayings like “Take me out to a ball game” or “For the love of the game”. Anything that inspires you! Baseball fans are passionate people and what could be better for a passionate fan than a baseball tattoo? It cements your love for the game and shows others that you enjoy sport and having fun. Whether you go all out and have a whole sleeve dedicated to baseball or just a small fun tattoo it means the same thing. It can provide you with encouragement and there’s a design for everyone. So even if it’s just a small bat and ball why not consider getting your own baseball tattoo?